The Brompton goodness continues with the arrival of the IT Chair kids' seat for Bromptons. Speedily dispatched from Barcelona via the Spanish Postal Service, it arrived in just ten weeks! 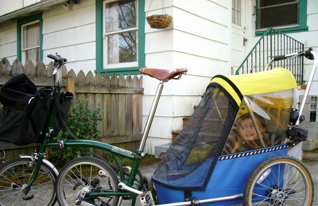 Now we can be out the door and on the road to friends, the park, store, school, train station or airport in seconds, without bothering with cumbersome trailers, big seats, straps, locks and all that, because the bike still folds up as handily as ever. That’s right, a Brompton well equipped is a kid carrier, a shopping cart, a taxi, carry-on luggage, and a surprisingly decent ride besides. 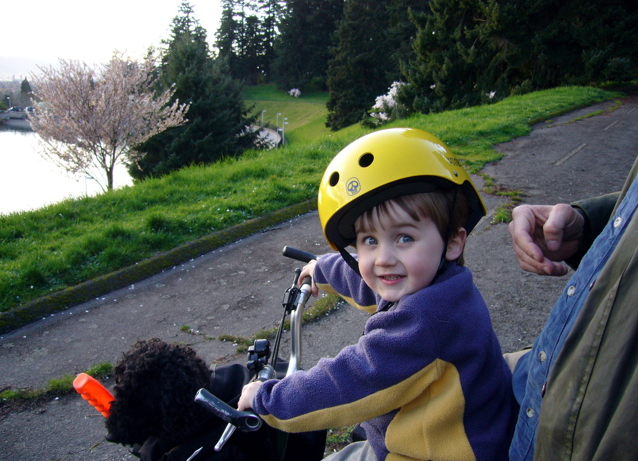 Son’s initial skepticism dissipated over our first five-mile ride. It’s nice to be able to carry on a quiet conversation with your kid as you explore. He’s in charge of ringing the bell. 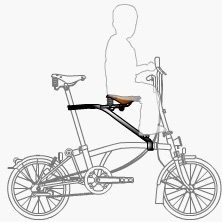 You do need to ride with your knees somewhat splayed to clear your child’s hips, but it’s not too bad. There’s a video clip of us underway, shot by the estimable Patrick, who also moved recently to Portland from parts south to enjoy the bikey goodness and raise chillun’ and chickens. He also documented my discovery of the IT Chair’s alternative, highly ergonimical seat-forward “triathlon training” stealth posture. Continuing in the oxymoronic vein of conspicuous bicycle consumption, this is the household’s second Brompton. We can now travel anywhere together as a family of three-plus by bike primarily, switching to bus, train, plane, boat or even taxi as required, without missing a beat. Eat your hearts out, giant motorcage slob-slaves, gym memberships and all. 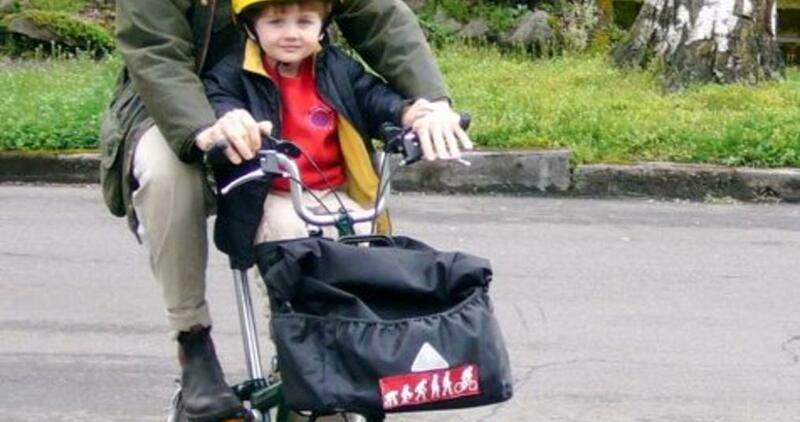 Bromptons are also trailer-friendly for inclement weather, longer trips around naptime, extra cargo or offspring. 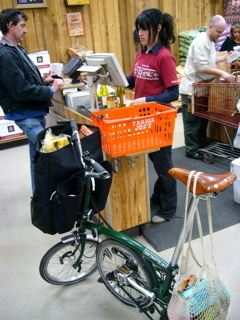 Shown here is a Wike; note that the hitch permits the Brompton half-fold while still attached.